ARLINGTON—Texas Trust Credit Union has surpassed $1 billion in assets, reaching $1,021,430,369 to be exact, achieving an ambitious, multi-year goal. 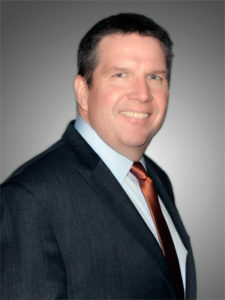 When joining the credit union in 2011, Jim Minge, President and CEO, was challenged by the Board of Directors, led by Larry Skinner as Chairman, to reignite the credit union’s growth. While the credit union was healthy, its growth was not keeping up with the booming population in its markets. Texas Trust also relocated its headquarters to an Arlington office park, which gave it room to add employees and serve more members. Overall, the credit union has grown by more than 33,000 members since 2011 with a total membership exceeding 84,500. The credit union doubled its number of branches by moving into new markets, adding two school branches and expanding its presence in Arlington, the largest city within its core field of membership. Additionally, Texas Trust vastly multiplied its ATM network by entering into partnerships with Allpoint and Dolphin Debit, which proved instrumental in giving members more convenient and surcharge-free access to their money. Through its Spirit Debit Reward program, Texas Trust differentiated itself and solidified strong community relationships with local school districts and the University of Texas at Arlington. The Spirit debit card opened new doors for the credit union, which increased member loyalty and brand visibility, and gave more than $1.3 million to participating schools based on card usage. The school relationships have also become central to Texas Trust’s mission of building brighter financial futures for its members and the communities it serves. Product enhancements focused on strengthening core deposits, mortgages, auto lending and leasing, credit card services, insurance and investments, and business loans, including SBA loans. Its Checking20 Account has been so successful that the credit union paid member bonuses in excess of $797,000 within 19 months of launching the product. 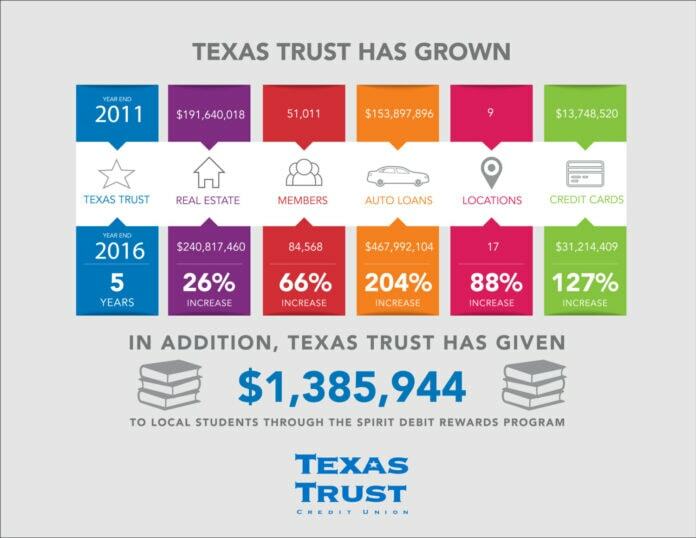 Texas Trust’s focus on improving its lending enabled the credit union to build its auto financing into one of the largest programs in North Texas. Additionally, growth in real estate lending – which surpassed $240 million – made Texas Trust one of the largest credit union mortgage lenders in the Dallas-Fort Worth market. On the technology side, Texas Trust improved operations and member services with a focus on convenience. It invested heavily to improve everything from back office loan processing to rolling out advanced mobile services that included card controls and remote deposit.